It’s that time of year again, and all of Oakland is getting ready to celebrate the first Friday of every month with the largest cultural event in the Bay Area. While this event draws people in from all over the bay, those living in the Oakland apartments have a front row seat to Oakland First Fridays. What Is The First Fridays Festival? First Fridays in an “immersive art and community experience” that takes place in Oakland’s KONO district on the first Friday of each month. Thousands of people from all over the Bay Area and beyond come together to view and experience art exhibits while enjoying some delicious food and a variety of entertainment. It’s a celebration of the eclectic nature of Oakland, as well as an enormous economic boon for the KONO community. Sponsored by Koreatown Oakland, a 501 non-profit, this is one event you won’t want to miss. The festival takes place on the first Friday of every month in the KONO district. It spans West Grand to 27th Street on Telegraph Avenue. You can catch the festivities from 5 to 9 p.m. The vision behind this festival is to become a premier Oakland event, positioning First Fridays as an epicenter where the community can come together and celebrate the area’s unique culture. It is also meant to support the arts and sustainable practices, both already heavily featured in the Bay Area. First Fridays is now in its 12th year, initially taking place back in 2006. When it started, the festival was just a collective of art gallery owners that now go by Art Murmur. They created a once-a-month gallery walk that included the 23rd Street Fair, which quickly exploded into the most renowned art, music, food and cultural community event in the Bay Area. The non-profit KONO assumed responsibility for the festival back in 2013, adding even more cultural diversity into the mix. Every year, the festival has grown larger and better with the addition of more performers and artists. As if there wasn’t enough culture in this fantastic festival, KONO continues to partner with Oakland Art Murmur in order to promote emerging artists within the city. Art Murmur places a strong emphasis on visual arts, providing an abundance of rich and diverse experiences for anyone attending the event. So, get ready for a one-of-a-kind experience. As you can imagine, a festival that attracts the entire Bay Area is as crowded as they come. So, we have a few tips to help you make the most of your time there. While anyone living in Oakland can take advantage of this easily walkable community, those coming in by car should reserve their parking ahead of time. SpotHero is an excellent reservation app that allows users to find and book affordable parking spots. For Oakland First Fridays, you can find spots up to 50% off and enter the code OAKLANDFF for an extra $5 off. If you’ve never been to the Oakland area before, then you’re in for a treat. This is the most walkable neighborhood in the Bay Area. You can find everything from fine dining to hand-crafted cocktails all within a city block, so don’t be afraid to explore while you’re here. For families, there’s going to be plenty of activities for children to take part in. Navigating the streets with a stroller is simple, and older children will quickly find themselves caught up in the magic of watching the various street performers. If you are a local artist or craftsperson who would like to participate in the festival by sharing or selling your work, then you can apply via this link. Vending spaces range from five feet to thirty, with prices ranging from $45 to $270 respectively. All spaces come on a “first paid, first reserved” basis. Staged or street performances, art installations, and non-profits are also welcome to participate in the event. So, sign up if you would like to be a part of this cultural Bay Area phenomenon. 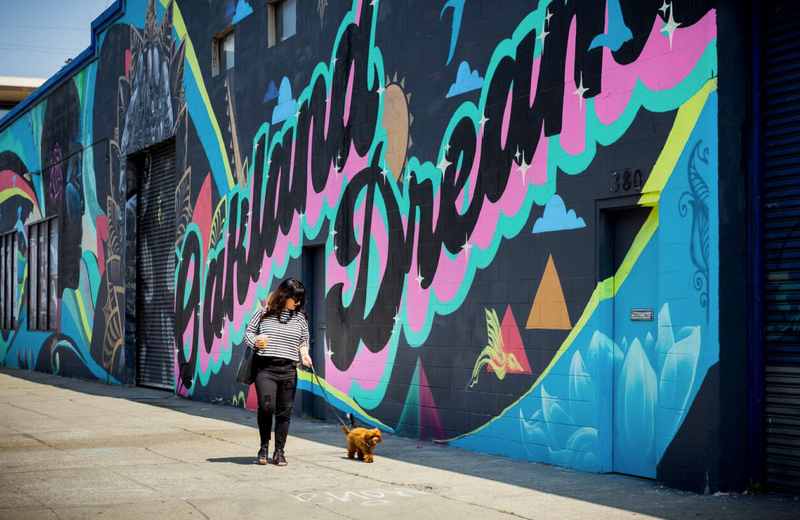 Located in the vibrant, walkable neighborhood of Oakland is Fourth Street East, the area’s premier destination. These luxe apartment homes combine the serenity of a waterfront locale with the excitement of a downtown address. Residents have easy access to the numerous transportation amenities offers in the bay. Both the ferry terminal and BART provide a relaxed commute to San Francisco’s Financial District, while the are itself is quickly traversed. Each home is equipped with the finest in modern furnishings, creating unique spaces to accommodate Californian lifestyles. Residents can enjoy sweeping views of the bay, high-end appliances, and finer touches like quartz countertops. Included are a wealth of amenities located within the building’s common spaces, designed to suit a variety of lifestyles from the entrepreneur to the fitness-oriented. We invite you to experience the joys of living in Oakland in an entirely new light. Fourth Street East is more than just another downtown address, it redefines the Cali lifestyle in the Bay Area. Welcome to a higher sense of living anchored by a down-to-earth, sustainable, progressive community. Welcome to Fourth Street East.